These songs are tested and loved by children! 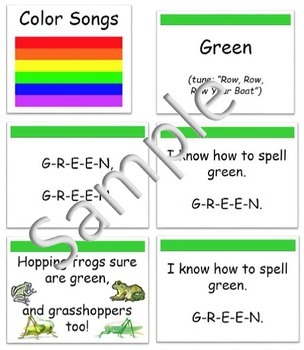 Display this product to help children learn their color words and read the sight words in the color song lyrics at the same time. Children can also re-assemble the parts of the songs in sequence using their reading skills if the songs are printed. Colorful clip art supports the reading and singing. This pack includes lyrics of songs which spell red, blue, yellow, orange, green, purple, brown, black, white and pink. It also offers lyrics to remember the order of colors in the rainbow. Each color song is set to a different classic children’s song (piggyback song). No music files are included, but each song lists a tune. The lyrics and clipart for each song can be viewed in a PDF or a PowerPoint movie (.ppsx) or as lyrics alone in rich text format. The PowerPoint movie has timings to match how the song is sung, or you can use the cursers to move to the preferred spot. The whole show with all songs is about 4 minutes. You can view this kind of file using Microsoft PowerPoint or with other programs depending on what is installed on your computer. No PowerPoint? Don’t worry! You can simply display it as a PDF. The PDF can also be printed as a book or in mini format using Adobe’s options of how many pages to print per 8 ½ by 11 sheet. There are approximately 6 pages per song. Last, you will find the lyrics only with all the words of each song on one page in rich text format which can be opened in Microsoft Word or several other programs so you can customize the text size or font to suit your students. •	RF.K.1a Follow words from left to right, top to bottom, and page by page. •	RF.K.1b Recognize that spoken words are represented in written language by specific sequences of letters. •	RF.K.2a Recognize and produce rhyming words. •	RF.K.3c Read common high-frequency words by sight (e.g., the, of, to, you, she, my, is, are, do, does). •	RF.K.4 Read emergent-reader texts with purpose and understanding.